I was trying to find out the underfunded pension plans of the world. One I know of is the illions $250 billion underfunding. Any others? I’m pretty sure Philadelphia is near bankrupt. At least there was some shady discount rate adjustments done a few years back. Just a thought - but wouldn’t most if not all pension plans want to be underfunded? Why would a pension plan actually WANT to be overfunded - that sounds expensive. 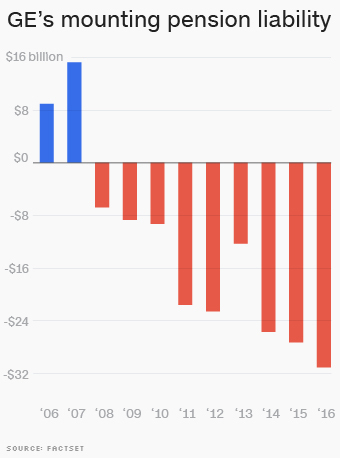 Check this out, GE’s underfunding. It is among the worst in the industry! Nothing could be as bad as GE. It has $31B underfunding. Do also look into the underfunding of Boeing & GM! Shouldn’t the regulators look into this more strictly? It is, though - The amount of monthly income insured by the PBGC has a cap. In 2018, for a pension recipient age 65 whose company plan was covered by PBGC, and who is taking a joint life payout with 50 percent that would be paid to a survivor, the maximum amount of benefit covered by insurance is under $5k a month.